North Korean leader Kim Jong-un's sister Yo-jong appeared in public for the first time in three months. The last time she was seen out and about was three months ago during the U.S.-North Korea summit in Singapore in June. 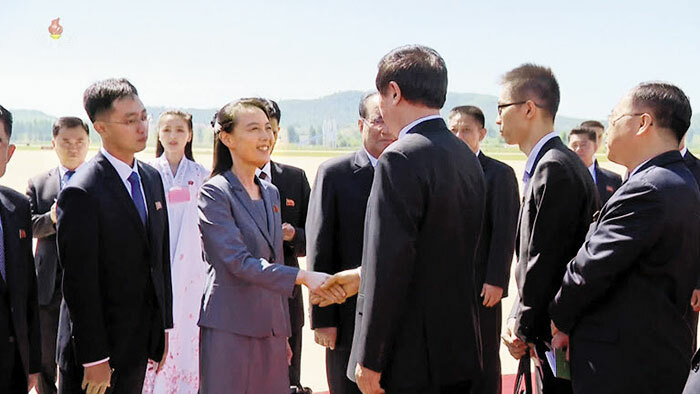 On Saturday, she welcomed Li Zhanshu, chairman of China's National People's Congress, at Pyongyang's Sunan Airport. The third-highest ranking Chinese official was in Pyongyang to attend a massive parade the following day marking the North's 70th founding anniversary. North Korean leader Kim Jong-un's sister Kim Yo-jong (left) shakes hands with visiting Chinese official Li Zhanshu in Pyongyang in this video grab from [North] Korean Central TV on Sunday. Meanwhile, North Korean top officials pledged allegiance to Kim Jong-un at a founding day ceremony on Sunday. Kim also promoted 46 military officers, a relatively large number for such an event, in an apparent move to win the loyalty of the unruly armed forces.